An Autodoner can be used for Gyros, as well as Shawarma, Doner Kebab, and Tacos Al Pastor, and perfect for any commercial restaurant or hotel serving meat. This vertical broiler contains two 20,000 BTU burners and has a capacity of 65 lb of meat. A dual gas control vertical broiler designed with 18” burners, offers the best uniform burn. It has an easy to clean, compact cabinet designed for operators using large and extra-large cones. This machine comes equipped with all the accessories needed for optimal use. Optimal Automatics, Inc. is the original pioneer and manufacturer of the Autodoner® for over 40 years. Our State-of-the-art vertical broilers are designed for quality broiling to deliver a crisp and juicy product. They are proudly made in the U.S.A. with the highest grade Stainless Steel, and heavy duty cast aluminum burners that deliver high infra-red heat. 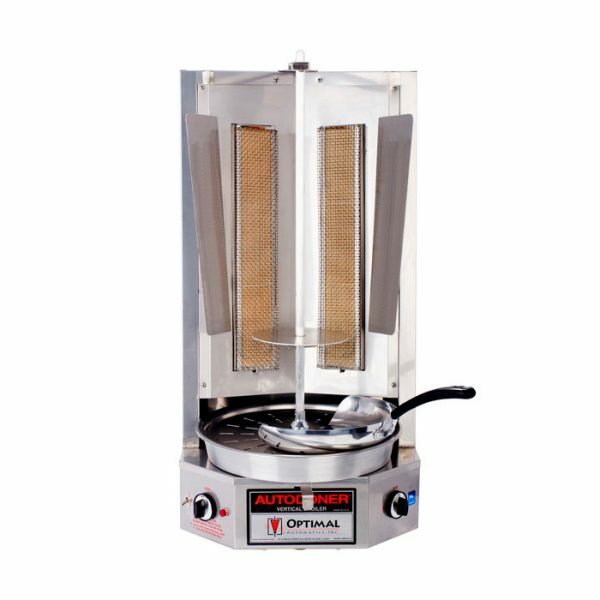 The Autodoner® vertical broilers are the standard in the restaurant industry.